Sample equivalence certificate format from university for admission purpose in Master and Bachelor Classes. Reference your application dated 17th November on the Subject. Two years B.Sc. degree from Govt. College University, Faisalabad has been considered as equivalent to B.Sc. 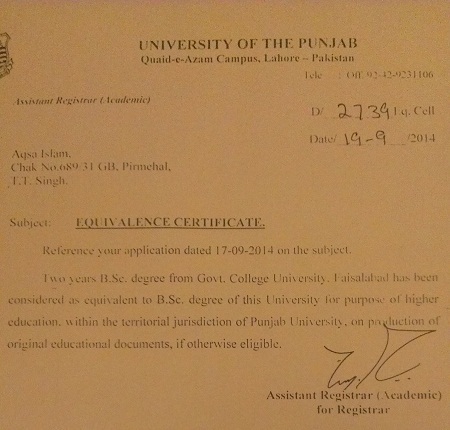 degree of this University for purpose of higher education, within the territorial jurisdiction of Punjab University, on Production of original educational documents, if otherwise eligible.